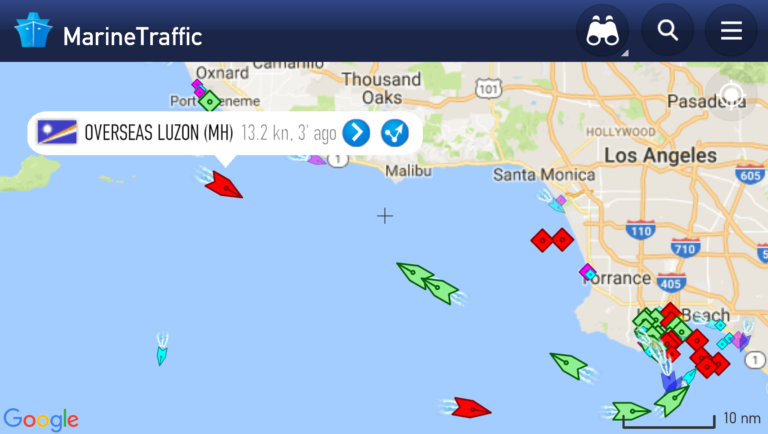 At current oil prices, Trans Mountain simply accelerates heavy oil sales to U.S.
BURNABY – After loading up at Kinder Morgan’s Westridge marine terminal last week, the oil tanker Overseas Luzon has arrived at Long Beach, California – where refineries are equipped to process Canada’s heavy, sour crude. This journey contradicts the core economic rationale for the Trans Mountain expansion, which is that it would deliver heavy oil to ‘new markets’ in Asia. In 2016, Asian refineries paid even less than U.S. refineries for comparable blends of heavy crude – as much as eight dollars less per barrel. National Energy Board data show exports of bitumen to non-U.S. markets averaging just shy of 240,000 barrels per day in the fourth quarter of 2015. That dropped below 83,000 barrels per day in the first three months of this year, then to zero since the beginning of April. Kinder Morgan’s application to the National Energy Board was submitted in December 2013, when the benchmark price of oil was over $105 per barrel. Prices are less than half that today. Dogwood Initiative is B.C.’s largest citizen group, uniting more than 260,000 supporters on issues including oil tanker expansion on the West Coast, U.S. thermal coal exports and big money in B.C. politics. I have tried to talk about this myth being repeated constantly on CKNW. I sat on hold for 27 minutes today to ask their guest that very question. As usual they found time for 4 or 5 callers questioning the rep from living oceans on things like ” where do you get your funding” and why are you not complaining about other tanker traffic. Surprise! They were unable to get to my call. The rep in favor even made the comment that we have to sell at a discount to he Americans because “our oil is landlocked” The fantastic host at CKNW did not even question this outright lie.